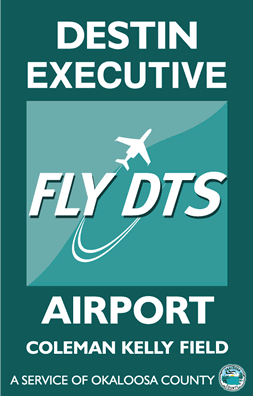 In addition to the Destin Executive Airport (DTS), the Okaloosa County Airports System is comprised of two additional airports, the Destin - Fort Walton Beach Airport (VPS) and the Bob Sikes Airport (CEW). 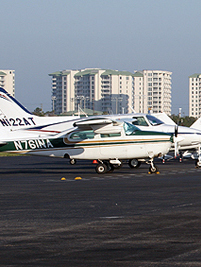 Destin - Fort Walton Beach Airport (VPS) - The Destin - Fort Walton Beach Airport (VPS) is the commercial service airport for the Florida Gulf Coast. Located 20 miles to the north on Eglin Air Force Base, the airport currently has four (4) airlines serving over 800,000 passengers per year with direct service to Atlanta, Charlotte, Dallas and Houston. The 116,000 square foot modern terminal was completed in 2004 with great fanfare and was selected as the Outstanding Commercial Service Airport of the year by the Florida Department of Transportation for aesthetics, safety and service. Shortly thereafter, the terminal received top awards in state and nationwide competitions by the Association of Builders and Contractors. The Bob Sikes Airport (CEW) is a haven for defense and industrial aerospace development as well as modification and conversion companies due to its 8,000 foot runway with an instrument landing system (ILS) and available acreage on and off airport for lease. Located near Crestview, Florida, The Bob Sikes Airport is a self sufficient General Aviation facility owned and operated by Okaloosa County and is not dependent on ad valorem taxes. Okaloosa County's Airport System is the aviation gateway to the Emerald Coast by providing world-class affordable, accessible, modern and secure facilities for the traveling public. The late Coleman Kelly established “Coleman Kelly Field” in the late 1950s, east of the City of Destin on what is currently called Airport Road. Mr. and Mrs. Kelly granted the property to the Okaloosa County Airport and Industrial Authority on January 22, 1964 to construct and operate the newly renamed Destin Executive Airport.